This page does not contain rigid rules or advice, it is just a brief guide designed to help those new to sidecars. The Federation of Sidecar Clubs or any individual member is not responsible for the advice on this site. Looking at the variety of sidecar combinations in the FoSC it is clear that the huge choice may baffle the newcomer. Before you go to view an outfit it's a good idea to think about how it will be used, for example, how many passengers will you be carrying regularly, how much luggage space would you like, do your passengers need to have full weather protection, how important is easy access, will you only be using the outfit locally or are you intending to tour great distances, will it be used mostly at speed on a motorway, or maybe you want something to explore rural, rutted tracks. Clearly identifying what you want to do with your sidecar outfit should help to prevent a buying mistake such as an 1800cc goldwing double adult combination to explore narrow rural lanes on your own with just a picnic and flask, or a light weight 350cc single seater combination to undertake that lifelong ambition of taking your partner and children on a tour of the scenic alpine passes. All of the above applies equally if you are having a sidecar attached to an existing motorcycle. In addition, take some advice about what size and weight of sidecars are suitable for the motorcycle you will be using. Don't go bolting a 1960's coach built double adult sidecar to a 1990's 400cc sports bike, or a 70 kg unbalasted single seater to a 2000cc maga tourer. You really won't like the results! Many experienced sidecar riders agree that leading link front forks specifically designed for or adjusted for your motorcycle will considerably improve steering. Both the feel and the weight of the steering is improved. Generally, the heavier the combination, the bigger the improvement. Light weight economy combinations such as the MZ250, Jawa 350, or Royal Enfield Bullet probably would not improve enough to warrant fitting leading link forks, whereas nearly every BMW or Guzzi between 750 and 1000cc will benefit from this conversion. Many experienced long distance sidecar riders have car wheel conversions carried out on their combinations. This has several advantages for high mileage, larger capacity touring combinations. Car tyres offer good grip, cost less and last longer than motorcycle tyres. Motorcycles with shaft drive may also benefit from having lower gearing due to the smaller wheel size. Light weight or low power combinations are rarely seen with car wheel conversions. Generally, the sidecar and bike tow in towards each other, so the track measured at the front will be narrower than the track measured at the rear of the machine. In addition to this, the motorcycle usually leans very lightly away from the sidecar. If you are new to sidecars and suspect the setup is not correct, you should either contact the FoSC technical officer or take your combination to a specialist company with experience of sidecars. It is not the intention of this site to give specific set up requirements as every combination (and every rider) is different. It is not possible to teach riding technique in a few simple sentences. If you are buying from a specialist sidecar dealer they will offer basic sidecar riding instruction when you collect your sidecar combination. Many private sellers are happy to spend a little time with you when you buy from them. 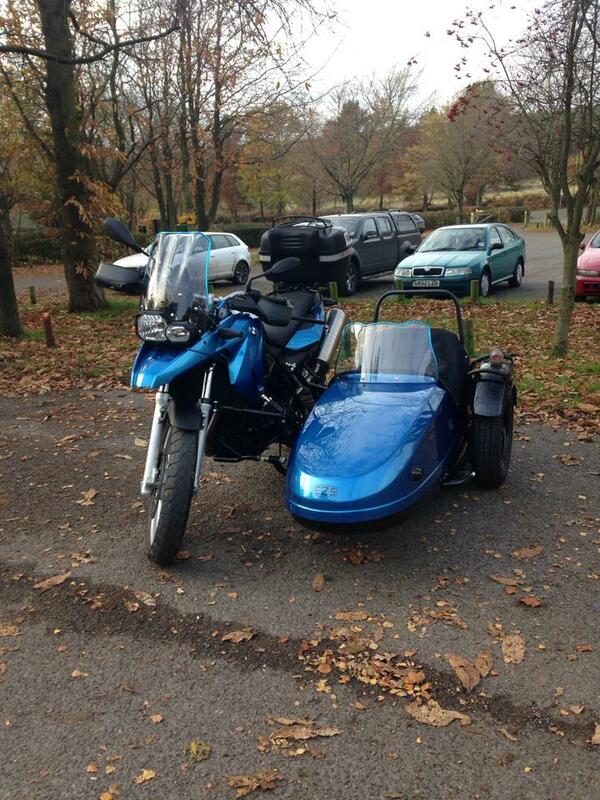 Len Tempest, the FoSC legal officer, offers one to one training in a purpose built dual control sidecar outfit. Make sure your first ride is not hurried and take things easy until you get the hang of it. Riding a sidecar combination is very different to riding a solo motorcycle and it will take time to adjust before you feel completely at home. As a very general rule of thumb, if the sidecar is fitted to the left side of the motorcycle you need to accelerate slightly as you turn the handlebars left to encourage the motorcycle to drive around the sidecar, and decelerate slightly as you turn the handlebars right to encourage the momentum of the sidecar to assist the combination in turning right. Practice this in a wide open space away from traffic. Once you have mastered driving a motorcycle and sidecar combination it is no harder than driving any other vehicle. Many outfit riders cover huge mileages, and get a great deal of fun from owning sidecar combinations. Check all the things you would normally check when looking at any used motorcycle, but in addition to this, pay special attention to wheel, swing arm, and steering bearings. Small amounts of play in these areas can make an otherwise very well set up combination handle very strangely indeed. Take a really good look at all the attachment points - pull them , push them, and try to detect any play. Also check that any attachment points, brackets and pinch bolts look up to the job. If the sidecar is attached with a couple of exhaust clamps and a jubilee clip, walk away quickly and spend your money wisely, elsewhere. There is a local sidecar club or group covering almost every part of the UK. Take a look at the Clubs in the Federation page of this site to find the closest to you. You will get a warm, friendly welcome at their local meeting. Come along to one of the events listed on the What's on and Events page. Stay in touch through our forum pages. Tell us about your experiences by writing a short article for the Outlook magazine.